In humans, the vertebral column serves as the central supporting pillar of the body, supporting the head and trunk. It also protects the spinal cord. It is made up of irregularly shaped bones called vertebrae, which are separated by fibrocartilaginous intervertebral discs. The vertebrae have been divided into five groups. There are seven cervical, 12 thoracic, and five lumbar vertebrae; five sacral vertebrae are fused to form the sacrum, and there are four coccygeal vertebrae, the lower three usually being fused. In adults, the spinal cord begins ros-trally above the foramen magnum, where it is continuous with the medulla oblon-gata and extends caudally as far as the level of the first or second lumbar vertebrae. The spinal cord possesses along its length 31 pairs of spinal nerves, each of which is attached to the cord through dorsal sensory roots and ventral motor roots. (There is evidence that there are some sensory fibers in the ventral roots as well.) The cord is a continuous structure, but is divided into segments through the spinal roots. A segment may be thought of as the area of spinal cord which possesses one pair of dorsal and ventral roots. Each segment may also have a pair of dorsal root ganglia. An exception is C1, which may have no dorsal root ganglion. 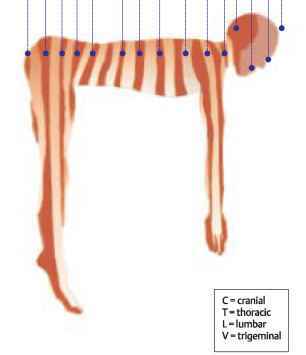 The cervical segments (C1-C7) supply the face, the neck, the arms, and the trunk; the thoracic segments (T1-T12) supply the trunk and the sympathetic ganglia; the lumbar segments (L1-L5) supply the legs; the thora-columbar segments also serve the sympathetic ganglia; the sacral (S1-S5) and coccygeal segments (one segment) supply the saddle region, the buttocks, and the pelvic organs. The sacral segments, together with the cranial nerves, also serve the parasympathetic ganglia. All sensory information to the CNS is relayed to the brain via the dorsal roots. Therefore the axons which arise in the dorsal root ganglia may be referred to as primary afferent fibers. The sensory fibers that enter the CNS have traveled from receptors in the body. Many of these receptors are located in the skin, and the area of skin that is served by a particular dorsal root ganglion is termed a dermatome. 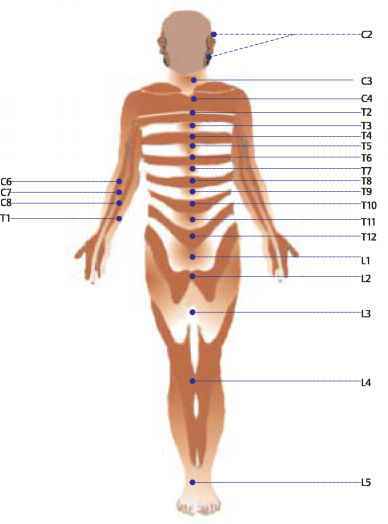 The dermatomes have been mapped (see pp. 154), and it has been discovered that there is significant overlap between different dermatomes. Therefore, damage to any one dorsal root need not necessarily result in loss of sensation within the corresponding dermatome. The ventral root axons arise almost exclusively from cell bodies in the ventral horn, and are mainly motor neurons supplying the peripheral skeletal musculature. The ventral root axons meet up with the peripheral fibers of the dorsal root ganglia to make up what is termed a spinal nerve. The spinal nerves ultimately merge to form the peripheral nerve. 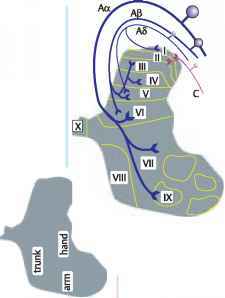 The dermatomes: dermatomes are areas of skin connected through sensory afferents to one or two dorsal roots. There is overlap between adjacent dermatomes; hence one dermatome may be covered by more than one dorsal root. 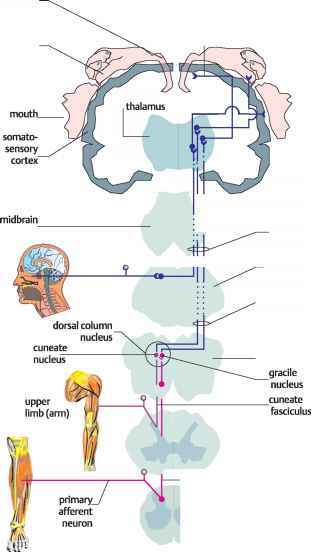 The sensory input from the periphery to the CNS is highly organized in the spina) cord in order to transmit information about the different modalities to the brain, and to facilitate rapid execution of the spinal reflexes. The gray matter of the spinal cord is surrounded by the white matter, which consists of the ascending and descending pathways or tracts. The white matter has been arbitrarily divided into three main sections, namely the dorsal, lateral, and ventral funiculi. The white matter of the cord is organized into pathways that separate the transmission of different sensations. For example, conscious and non-conscious proprioception are separated, as are pain and light pressure. Information about conscious propri-oception will ultimately reach the cerebral cortex, while non-conscious propriocep-tion is carried to the cerebellum. All sensory information enters the spinal cord through the dorsal roots. Where the dorsal root fibers enter the spinal cord at the dorsal root entry zone, these separate into two divisions, the medial and lateral divisions. The medial division contains fibers whose original receptors include those in skin, joints, and the spindles. The fibers are of relatively larger diameter than those in the lateral division, and carry information about muscle length and tension; they mediate spinal reflexes either through direct synapsis with motoneuron or through inter-neurons. They also transmit information to the ascending fiber tracts. Dorsal root fibers that target the local segment of entry will enter the gray matter through the dorsal horn and synapse with inter-neurons or with motoneurons at the same segmental level. These dorsal horn entry fibers and interneurons therefore constitute the central afferent arm of the reflex arc. Axons and collaterals of the medial division may enter the white matter in the dorsal funiculus and ascend the spinal cord where they will eventually synapse in relay nuclei. Fibers that enter the white matter in the dorsal funiculus will displace more caudal inputs towards the medial part of the cord. Thus a sort of lamination of dorsal column pathways occurs, with sacral inputs more medially placed than lumbar inputs and so on. and thermal from viscera and skin afferents - larger myelinated from muscle, muscle spindles, joints, and skin dorsal root entry zone division of afferent axons in spinal cord. There are two main afferent sensory pathways which carry somatic sensation to the brain. These are the posterior or dorsal column lemniscal pathway and the spinothalamic pathway. Both pathways have several important features in common. (i) Both consist of first-, second-, and third-order sensory neurons. (ii) The cell bodies of the first-order neurons lie in the dorsal root ganglion, and those of the second-order neurons lie ipsilaterally in the gray matter of the spinal cord. (iii) The second-order neurons decussate, i.e. 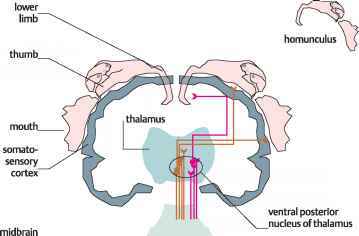 cross the midline of the cord, and ascend to terminate, ultimately, in the thalamus. The third-order neurons terminate in the so-matosensory cerebral cortex. (iv) The gray matter of both pathways where neurons terminate can be shown to represent specific areas of the body, i.e. the pathways are somatotopic. (v) At these terminations, synaptic transmission can be stimulated or inhibited by other neurons. The dorsal columns are made up chiefly of the thick, myelinated fibers that enter the cord and turn to travel rostrally towards the brain where they terminate in the dorsal column nuclei of the medulla. The more caudally derived gracile fasciculus terminates in the gracile nucleus, while the more rostrally derived cuneate fasciculus terminates in the cuneate nucleus. From there, the second-order fibers decussate to the contralateral side of the cord and ascend in the medial lemniscus. The medial lemniscus terminates, ultimately, in the lateral portion of the ventral posterior nucleus (ventral posterolateral nucleus) of the thalamus. From there, the third-order neurons project to the somatosensory cortex. 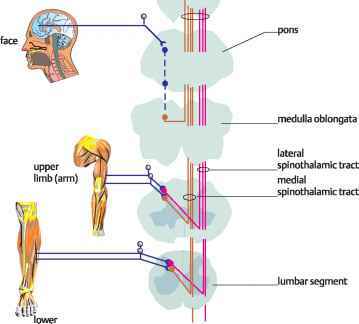 Functions of the dorsal column medial lemniscus system: The system subserves modalities of conscious proprioception and discriminative touch. These two modalities together inform the parietal lobe of the cortex about the position of the body at rest or when moving at any given moment of time. Damage to the medial lemniscus will impair, for example, the ability to grasp moving objects such as the handle of a door, or of a moving bus. Damage is exhibited as sensory ataxia. The symptoms in extreme cases are the inability to stand unsupported when the feet are spread apart and the patient is looking down at them. The patient will sway when the feet are together and eyes are closed (Romberg's sign). Also, the patient stamps the feet when walking to enhance remaining proprioceptive facility (the 'stamp and stick' gait). Diseases that damage the dorsal columns include multiple sclerosis, which is an immune demyelinating disease of the nervous system. 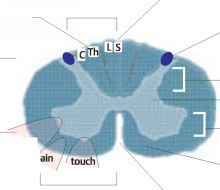 Here, there is specific damage to the cuneate fasciculus, causing loss of proprioception in hands and fingers, and an inability to identify shapes through touch alone (astereogno-sis). Deficiency of vitamin B12 (cyano-cobalamin) leads to subacute combined degeneration of spinal cord, as well as to pernicious anemia. Tabes dorsalis is a late symptom of CNS syphilitic infection, which affects principally the lumbosacral columns and roots, and the patient exhibits sensory ataxia. The spinothalamic pathway lies in the ventral horn of the spinal cord, lateral and ventral to the gray matter. It is made up of second-order afferent sensory neurons that originate in Rexed's laminae I, III, IV, and V of the dorsal horn gray matter. These cross over to the contralateral side in the anterior commissure and run rostrally in two separate tracts, the medial (anterior) spinothalamic tract and the lateral spinothalamic tract. (Note that axons that transmit temperature and pain decussate within one spinal segment of their origin, whereas those transmitting pressure and touch may ascend through several spinal segments before decussation occurs.) The spinothalamic tract is also sometimes called the anterolateral tract. In the brain stem the two tracts merge to become the spinal lemniscus, which runs close to the medial lemniscus, and which picks up the trigeminal afferent fibers from the head (see p. 159). The tract terminates in the thalamus in the ventral posterior nucleus immediately caudal to the terminations of the medial lemniscus pathway. From there, third-order neurons project to the somatosensory cortex. Functions of the spinothalamic pathway: As mentioned above, the spino-thalamic tract carries conscious pain and temperature sensation. It also carries crude perception of touch and pressure. Spinothalamic neurons can be classified as (i) low threshold units which respond only to light touch of, e.g., skin; (ii) wide dynamic range units (WDR), which respond to nociceptive stimuli; (iii) high threshold (HT) units, which respond only to relatively high stimuli which activate nociceptive receptors; (iv) thermosensi-tive units, which respond only to warming or cooling of thermoreceptors in skin. In addition, there appears to be functional differentiation in the termination of second-order neurons in the thalamus. For example, more posterior terminations may carry sensation of non-localized immediate perception of pain, whereas those ending higher in the ventral posterior nucleus may mediate exact localization of the pain. Information about the role of the spinothalamic tract comes largely from the surgical procedure of cordotomy, to relieve the pain in, e.g., terminally ill cancer patients. A needle is passed into the subarachnoid space and into the spinal column and up the anterolateral region. Progress is monitored using X-rays. A stimulating electrode inside the needle generates a small pulse, and in the right place should elicit pain on the contralateral side of the body. The pathway is then destroyed by an electrolytic lesion. The spinothalamic tract can become damaged in the rare condition of syringo-myelia, when the central canal distends and compresses adjacent pathways. The lesion or syrinx (a fusiform cyst) damages the decussating fibers of the tract in the ventral white commissure, commonly in the cervical region of the spinal column, resulting in selective loss of temperature and pain appreciation in the upper limbs. Proprioceptive sensation and light touch are not lost. The patient will inadvertently burn or injure hands and arms and dislocate joints without feeling pain. There are four fiber tracts that run up the spinal cord to the cerebellum. 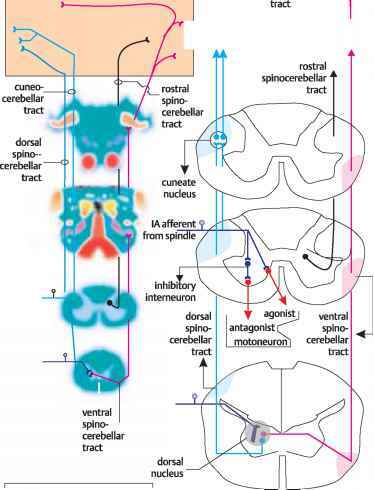 These are the ventral spinocerebellar (SP) tract, the dorsal SP tract, the rostral SP tract, and the cuneocerebellar tract. The spinocere-bellar tracts serve the modality of unconscious proprioception. The dorsal and ventral SP tracts run up the spinal cord near the dorsolateral and ventrolateral surfaces respectively. Both tracts consist of second-order neurons that receive their inputs in the gray matter near the base of the dorsal horn from terminations of 1A afferents from the muscle spindles, Golgi tendon organs, and certain touch receptors. From there, the second-order neurons run directly into the cerebellum where they terminate, mainly in the vermis. The dorsal (posterior) SP tract originates in lamina VII in the dorsal nucleus of Clarke (nucleus dorsalis, thoracic nucleus). The primary 1A afferent fibers enter the cord and synapse either directly in the ventral horn with motoneurons to an agonist muscle or with interneurons to the antagonist muscle, thus completing the reflex arc. Also, the afferents send collaterals that travel up the cord to the dorsal nucleus, which extends from T1 to L1. Here, the afferents synapse with the second-order neurons of the dorsal spinocerebellar tract. In this way information from proprioceptors can be used for reflex muscle responses and also be relayed to the cerebellum. In addition, the dorsal nucleus receives inputs from skin. The dorsal spinocerebellar tract consists of the largest afferent fibers in the nervous system, being about 20 ^m in diameter, and of high conductance velocity (120 m/ sec). The tract rises ipsilaterally and enters the cerebellum through the inferior cere-bellar peduncle. The ventral spinocerebellar tract consists of second-order neurons that arise from a spinal border cell in lamina VII in the dorsal nucleus, decussate to the contralateral ventral cord, and ascend to the cerebellum, which they enter through the superior cerebellar peduncle. Some of the axons of this tract may then cross over to the other side of the cerebellum. The rostral spinocerebellar tract arises in the upper (cervical) portion of the cord and travels ipsilaterally to the cerebellum. The cuneocerebellar tract arises from the accessory cuneate nucleus, which lies outside and immediately above the cuneate nucleus (see p. 10). Primary afferent 1A fibers reach the accessory cuneate nucleus through the cuneate fasciculus and synapse with the second-order fibers of the cuneocerebellar tract. These fibers ascend to the cerebellum via the inferior cerebel-lar peduncle. Some other cell groups in the spinal cord, for example the central cervical nucleus (CCN), send projections to the cerebellum. CCN fibers send information mainly from receptors around the cervical joints. Spinocerebellar pathways that travel uninterrupted by synapses (in the mid-brain) to the cerebellum are termed direct spinocerebellar tracts, while those that may be interrupted by synapses are termed indirect spinocerebellar tracts. Most of the fibers of the spinocerebellar tracts terminate in the cerebellum ipsi-laterally with the cord. The tracts terminate in the cerebellum in an orderly manner reflecting their somatotopic organization. There are a number of other minor ascending somatosensory tracts in addition to the major dorsal column lemnis-cal, spinothalamic, and spinocerebellar tracts. These carry information, indirectly, from peripheral cutaneous sensory receptors, sense organs such as eyes, or ears, or from proprioceptors, and arise in the spinal cord. 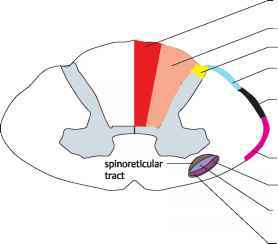 Indirect spinocerebellar tracts: The spinotectal tract (see also p. 2) is a small crossed tract, a supplementary pain pathway that is thought to arise in dorsal horn cells in the spinal cord and ascends closely associated with the lateral spinothalamic tract. It terminates in the superior col-liculus, where its information is integrated with visual inputs to the colliculus. The tract is believed to carry pain afferents to the tectum, which is concerned with reflex head movements in response to pain. The spino-olivary tract is a small, crossed tract, which carries tactile information to the inferior olivary nucleus, a folded gray mass in the medulla oblongata. The inferior olivary nucleus integrates sensory information and projects this to the cerebellum via the inferior cerebellar peduncle. The tract may be involved in motor learning processes in the cerebellum, and modifies olivary discharges during motor movement when, for example, the organism encounters unexpected physical obstacles during movement in darkness. The spinoreticular tract is a phylogeneti-cally ancient polysynaptic pathway that ascends bilaterally to the brain stem reticular formation, from where fibers ascend to the cerebellum via the inferior peduncles. The tract is believed to mediate arousal. 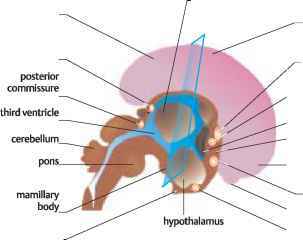 The trigeminothalamic tract carries somatosensory information from the head region. The trigeminal system is dealt with more fully on p. 222. Pain can be defined as an unpleasant emotional and sensory experience, which may be associated with actual or potential tissue damage. There are thus two main components: the motivational-affective (emotional) component, and the sensory-discriminative component. Also, noci-ception and pain are not necessarily the same. Nociception is the awareness of the stimulation of nociceptors by a noxious stimulus. The information is relayed via primary afferents to the spinal cord and hence to the brain where the location, onset, intensity, and duration of the stimulus are appreciated. Pain is the subjective response of the individual to the nociceptive input to the brain, and it may be totally unrelated to the actual physical parameters of intensity and duration of the stimulus. The pain experienced may be determined by several emotional and cognitive factors, including anxiety, anticipation, past experience, and sociocultural influences. This is the motivational-affective component that overlies the sensory-discriminative (nociceptive) component. Two types of input serve the sensory-discriminative component. We may experience a sharp, highly localized pricking or first pain, and a more prolonged, slower or burning (second) pain. Pricking pain is thought to be carried by AS fibers, and burning pain by C fibers. Both inputs terminate principally in laminae I, II, and III of the dorsal horn in the spinal cord, where most, if not all, of the nociceptive inputs from the periphery terminate. Other laminae, for example V and VIII, also appear to be involved in the control of pain transmission. Greenstein, Color Atlas of Neuroscience © 2000 Thieme where it is ultimately appreciated. Knowledge of these mechanisms is important for pharmacological and surgical control of pain in patients. The brain areas known to be concerned in pain control are the prefrontal cortex, the somatosensory cortex, the peri-ventricular nucleus in the hypothalamus, the periaqueductal gray matter in the midbrain (PAG), the nucleus raphe magnus in the reticular formation of the medulla, and the pars caudalis of the trigeminal nucleus (see also p. 222). It is known, for example, that stimulation of the PAG in conscious rats induces analgesia and abolishes surgical pain. 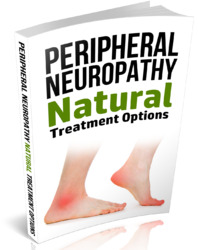 Patients with chronic severe pain have been helped to some extent by stimulation of the PAG. The main pathway for pain control by the PAG appears to be to the raphe nucleus magnus and other nearby nuclei in the reticular formation. Important fibers descend from these nuclei down the spinal column in the dorsal part of the lateral funiculus. If these fibers are cut, then stimulation of the PAG no longer produces analgesia. The limbic system and neocorti-cal regions appear to be involved in the emotional and cognitive responses to pain and the anticipation of pain, but very little is known of the pathways and mechanisms involved. Where is the lumbar vertebrae located front view? Where is the cauda equina diagram?